SPANISH LOOKOUT, Belize, Sept. 21 - Cancer and other illnesses are on the rise and we yearn for better and more cost efficient healthcare. World unrest, economic uncertainty, and natural and man-made disasters are occurring more frequently—we require healthful guidelines for our physical, emotional and spiritual well-being. Setting Yourself Apart from the SEEDS of CANCER: A Natural Health and Survival Guide—co-authored by Dr. Morris F. Keller and his wife, Kathryn Rose Mandel-Keller—enables us to meet these challenges at a much needed time...now. Dr. Keller survived a cancerous death-sentence using only natural methods. Keller was shown a new path and purpose for his life in serving God by teaching others time-tested and learned principles and techniques for healthful living. Published for non-profit by the Fountain of Life Church in Belize, this book encourages us to return to biblical truth and reveals how modern lifestyles, industrial and agricultural practices influence our health. Readers will discover the sound reasoning behind and the details for doing a complete body cleansing program, for making healthier choices in life, and for leading by example to help improve the lives of others. Born, raised and educated in America, Dr. Keller and his wife are now health missionaries living in a modern-day Mennonite community in Belize. Their book reflects Dr. Keller’s diverse life experiences: first as a student, then as a physician/surgeon, a cancer survivor, nutritional coach, chef, artisan baker, organic farmer and teacher. A culmination of his seventy-seven years, Dr. Keller’s personal history and spiritual journey poses a challenge to readers to re-evaluate their own lives and be willing to change—to improve their own health, the health of society and of this planet. Together, the Kellers continue to coach students and present free natural health seminars providing hope and basic tools for emergency survival. All royalties go toward missions work. SPANISH LOOKOUT, Belize, May 18 ‒ A new book on natural healing released today tells the triumphant story of one man’s victory over cancer when conventional medicine offered no hope. Over forty years later and still cancer free, Dr. Morris F. Keller offers a proven lifestyle for Setting Yourself Apart from the Seeds of Cancer in this must-read book about staying healthy - physically, emotionally, mentally, and spiritually. Keller was a young podiatric surgeon when diagnosed with colon and pancreatic cancer. The same disease had taken his father and grandfather; the prognosis was grim. Desperate for hope against such a death sentence, Keller began researching - and then following - natural healing methods. They worked. In two years, the cancer was gone. Keller came to recognize the marvelous engineering of the body to produce optimum health when it is nurtured. He learned that Western lifestyles and prevalent industrial and agricultural practices wreak havoc on good health. And, he saw the critical role of balance in life. Born and raised Jewish, Keller’s quest for healing kept bringing him back to God. In his searching, he met his Creator and found a more devote path and life purpose living a life in Torah. And he found a new passion to serve God by teaching others about healthful living. 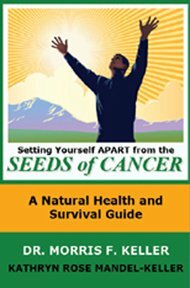 Setting Yourself Apart from the Seeds of Cancer: A Natural Health and Survival Guide is an account of Keller’s experiences and techniques for becoming healthier, preventing illness, cleansing the body of toxins, building immunity, and living a balanced life. Keller and his wife and co-author, Kathryn Rose Mandel-Keller, help the reader understand how the body was created to work and why people become sick. They chart a clear course for healthful living that anyone can follow. About the Author: Dr. Keller is a graduate of Ohio College of Podiatry and a third-generation surgeon. He has spent the last 40+ years in natural healing. The Kellers are health missionaries living in a Mennonite community in Belize, coaching students, and presenting free natural health seminars.